Today’s Super-Fast Friday is simple but has saved me a ton of time over the years. I work at home, which means lots of daily interruptions. He’s hitting me! I can’t find my socks! I’m bored! I want a snack!! There’s not much to do about a lot of those, but the snack thing is pretty easy. You need two smallish containers, one for the fridge and one for a lower shelf in a cabinet. I use a napkin-sized woven basket for the first, and a hard plastic bin for the second. These are your snack baskets. The refrigerator snack basket generally has a few pieces of fruit that don’t require peeling (apples, pears, plums), string cheese, yogurt in a kid-friendly form (we like Go-Gurts, which are surprisingly low in sugar), and small containers of hummus with baggies of baby-cut carrots. The cabinet snack basket has whole-grain crackers, individual snack-sized boxes of raisins, granola bars, cereal bars, peanut butter crackers, and little bags of low-sugar cereal in snack size portions. My kids have known since about age two that the snack baskets are fair game. If you’re hungry, you may have anything in there. Kids tend to self-regulate with food at a young age, so overeating or binging has never been a problem. The snack basket saves me a ton of time, and gives them a little self-reliance at a young age. They make their own choice, serve themselves, and fill their own tummies. I just refill the baskets at night and we’re set for the next day. 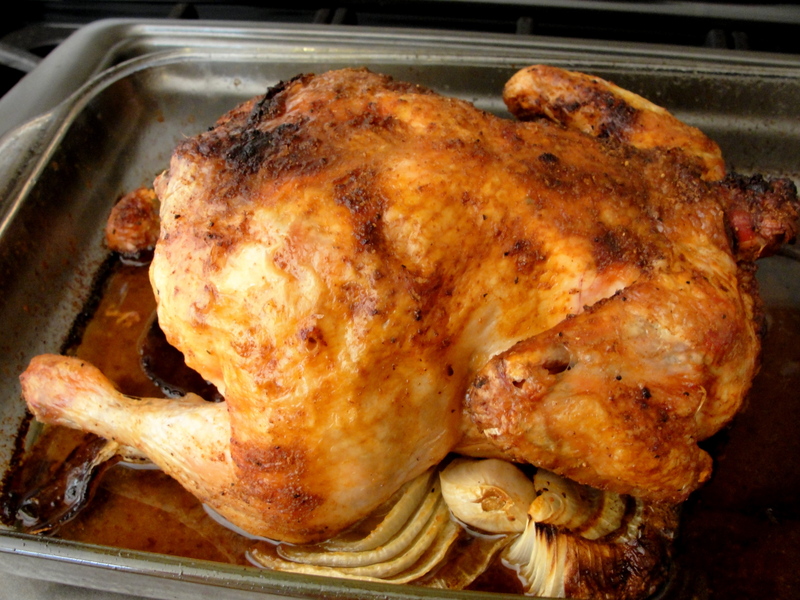 Roasted chicken, in my humble opinion, is one of the world’s perfect comfort foods. Nothing says “comfy at home” like a plate of simple roast chicken with a side of potatoes and a green veggie. Of course, the chicken has to be tasty and juicy, which we covered a few weeks back. Simple and tasty, it is among my favorite dinners. My family disagrees with loud abandon, actually. There is much eye-rolling on roasted chicken night. There is picking at plates and whining and a general aura of disgust when I roast a bird and set it lovingly before them at 6 p.m.
Because I don’t know what in the world is wrong with all of them and because I regularly cook their favorites even when they’re not my personal favorites, we continue to have roasted chicken. Life is hard and they will deal and Mommy is, despite the grousing, happy. But that doesn’t mean I don’t occasionally pity them and think about shaking things up from time to time. The other night was one of those days. I had a whole chicken in the fridge and a bottle of mesquite seasoning in the drawer and a family full of Mexican food lovers, and one thing led to another, and a new twist on roasted chicken was born. The concept is the same as perfect roast chicken. You’re going to put the bird in a hot oven with some citrus and some savory things inside it and some onion underneath it. Only before you do that, you’re going to let it sit in the fridge overnight with mesquite seasoning rubbed on and underneath its skin. This may be my new favorite way to cook a chicken. Seriously. It’s slightly different than anything you’ve had before, in the most wonderful way. DS had his customary drumstick. DD shredded hers up and put it into a leftover taco shell with some cheese and salsa. This would be great in taco soup or a quesadilla or enchiladas or just the way I had it–all by its lovely self on the plate with some vegetables. DH and I ate half of the white meat the night I made this. Last night, I diced up the rest and made a big pot of Perfect Corn Chowder, with a loaf of sweet white bread. I’ll have leftover soup today. About two hours before you’d like to eat, heat your oven to 450 degrees and spray a roasting pan or simple 9 x 13″ baking dish (with high sides) with cooking spray. Lay the onion slices and all but 4 cloves of the garlic on the bottom of the dish, covering at least its center. Pull the chicken out of the refrigerator. Put your lime quarters and remaining four cloves of garlic inside the chicken. Melt the butter and gently brush it all over the outside of the chicken. Lay the chicken breast-side down (that’s probably not how your mom did it, but keeps the white meat juicy) on top of the onion slices and garlic cloves in the dish. 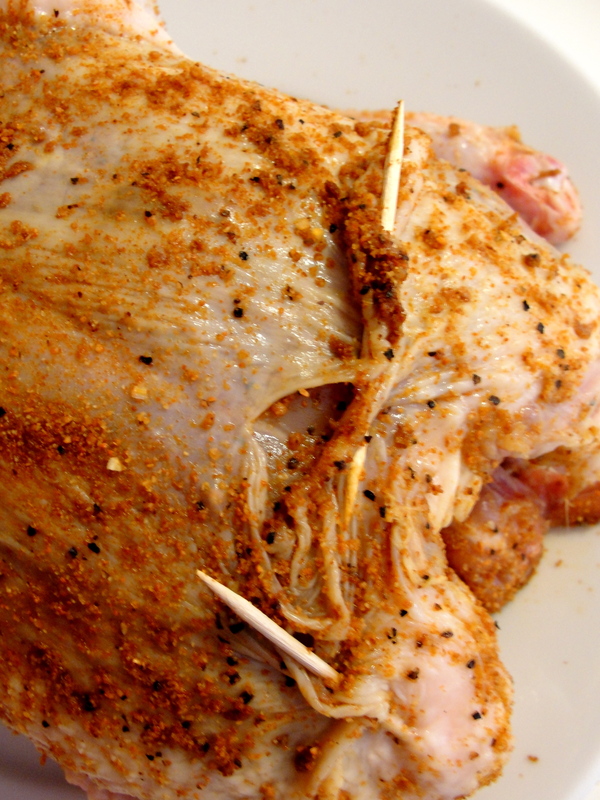 Roast the chicken for about 90 minutes, or until the internal thigh temperature is 170 degrees (please use a meat thermometer when you roast poultry. Salmonella is not fun.). Pull it out of the oven, let it rest 20 minutes, carve and enjoy. OK, slush day. At least so far. But we’re expecting a bunch of the white stuff later and the kids are home from school and this minivan-rocking mom doesn’t drive in freezing precipitation. And all of that equates to about 15 hours of time to fill in the house. OH YEAH? WELL I NEVER HAD A SWEET POTATO UNTIL THREE YEARS AGO! That’s my fantasy retort to my children’s frequent occasional protests that they have nothing cool, we never do anything fun, and that they are Sorely and Unfairly Deprived When Compared To Their Friends. I haven’t used it yet, but I’m not above pulling it out one of these days. Because it proves that I am the most deprived person around, and perhaps in the universe. Sweet potatoes are proof that God enjoys good food. They’re chock-full-of-nutrients good for you, they’re low in calories, they’re easy to grow and thus plentiful all year long, they store forever (so even my Soviet supermarket can’t mess them up like the other produce in the store), and they live up to their names. They are sweet. Sweet makes me happy. Sweet in a little nutrient bomb that you can cook a trillion ways is just about my idea of heaven on a plate. And since trying my first one a few years ago (blame my parents…always blame the parents), I have been all-out addicted. We always have them in the house and I am forever messing around with them. I tried something new with chicken last night (we’ll talk about that later this week–I promise) and needed a veggie with a bit of a southwestern flare to go with it. The tubers called to me from their basket under the stove, and a very simple dish was born. My daughter loved it. My son declared it too spicy, but then ate it. And my husband declared that he “probably won’t like this,” but downed his too. That, my friends, is a vegetable success by any meausure. This is so simple that I’m almost embarrassed to present it as a recipe. But you should try it. At least once. Even if you probably won’t like it. Because I suspect you will. You know that sweet/salty thing we’re all nuts about right now? Sweet/spicy rocks its world, and this is that. Olive oil spray, either canned or from a Misto, which is one of the best kitchen toys ever and where I get mine. Cover a heavy baking sheet with foil and spray it with olive oil. Preheat your oven to 400 degrees. 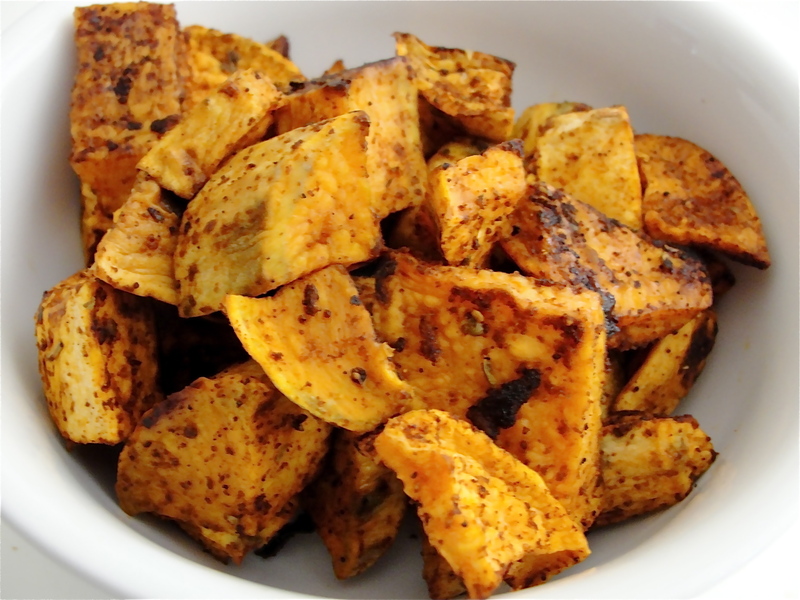 Peel the sweet potatoes and cut them into about 1.5 inch cubes–slightly bigger than comfortable bite size. Put them into a large bowl. Spray the top layer of spuds with oil (lightly) and toss them. Do that a few times until all the ‘taters have a little oil coating them. Then sprinkle in the chili powder, a bit at a time, stirring after each addition, until they’re lightly coated with that. Pour the potatoes onto the baking sheet in a single layer. Roast about 30 minutes, stirring after 15, or until they’re fork-tender. Let them cool for a minute and enjoy. Have you entered to win our giveaway yet? There’s a new button over there on the right (you’ll have to click through if you’re on email subscription, Kindle, or a blog reader–sorry!)? That’s for Playing With My Dinner’s brand-spanking new Facebook page, where our readers are already chatting, sharing ideas, and getting the inside scoop on the blog. To celebrate its launch, I’m giving away a copy of Aviva Goldfarb’s newest cookbook, “SOS! The Six O’ Clock Scramble To The Rescue.” It’s all about making healthy, Earth-friendly meals your kids will love, and you’re going to love it. One lucky reader will find a copy in his or her mailbox, and all you have to do to enter is “like” the blog over on Facebook before February 5. I’ll use a random number generator to pick our winner. So c’mon over! Visit the page, hit that “like” button, and join in the conversation on the wall. See you there!! It’s nine degrees as I type this. Nine. And it was a very, very cold weekend–DH took our son to a Boy Scout event and the poor kids’ dishwashing water was frozen. You’d think I’d break out the Crockpot for a steaming bowl of chili or chicken and sausage. I, however, wanted something lighter. Maybe I’m living out some summer fantasies at the dinner table, but when I came across a recipe for a very light pasta, fish, and veggie dinner, I had to try it. 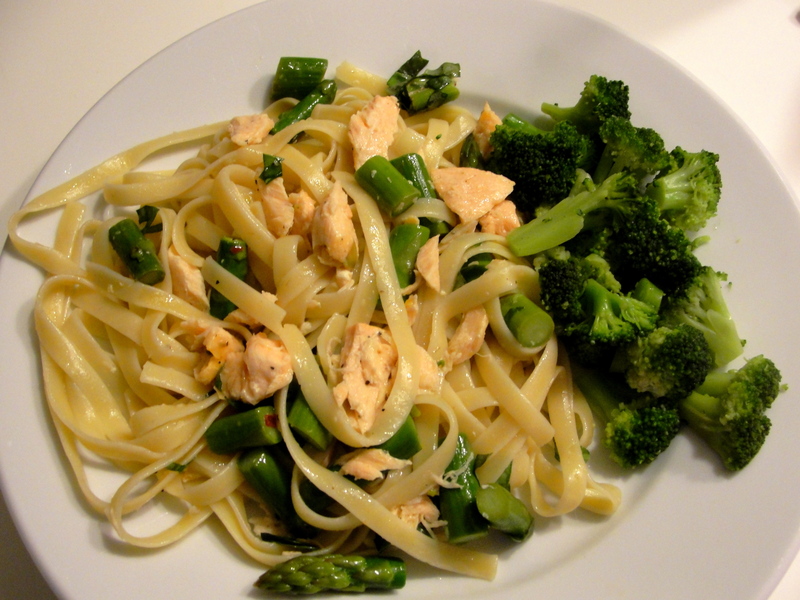 This started out differently–I substituted broth for water, added lemon (and then more lemon), upped the asparagus-to-noodle/fish ratio substantially, and tossed in some fresh basil that wasn’t called for in the original recipe. I also cooked the fish differently than the original recipe called for (they wanted you to nuke plain salmon–um, yuck) and spiced it up a bit. The result was good. It could use a little something, though. Next time, I’ll toss in a pint of halved cherry tomatoes. I added some more lemon when I reheated this on night 2 and that helped a lot, so I’ve adjusted the recipe accordingly. Heat your oven to 350 degrees. Sprinkle the lemon pepper all over the salmon, coating both sides, and place it into a small casserole dish sprayed with cooking spray. Bake it for 15 minutes or so, until it’s cooked through. Let cool. (I did this step in the morning and set it in the fridge all day). Get a large pot of water boiling, salt it liberally, and cook fettuccine until it’s al dente (start on the sauce while this goes). Drain well. In a large skillet (I used my Calphalon Everyday pan), heat the olive oil over medium heat. Add garlic and red pepper flakes and saute about 2 minutes–don’t let the garlic brown! Add asparagus and saute about 2 minutes, stirring constantly. Add hot chicken broth and salt, cover pan, and let cook about 2 more minutes. Uncover, let it go one more minute, stir in the lemon juice, and remove it from the heat. Use your fingers to break the salmon apart into chunks. Add to sauce mixture. Return fettuccine to its cooking pot and pour sauce over it. Toss together and serve with a little grated Parmesan cheese, if desired. Today, we introduce Super-Fast Friday and I hope you’ll like it. Every Friday, I’ll share a tip or trick or idea to speed up your meal-making time. Kind of like real food in less time, giving you more time to spend with your family. As we go, I’d love to hear your tips as well! Leave them in the comments here or over on our Facebook page. We do big breakfasts on the weekends. DH and I enjoy steel-cut oats from the slow cooker and the kids like pancakes or waffles. Have you read the ingredients on a box of frozen pancakes lately? Can you pronounce all of that? Double up your batter ingredients when you have everything out anyway. Let the extra cakes or waffles cool completely to room temperature, and then pop them into a freezer zip-top bag and into your freezer. 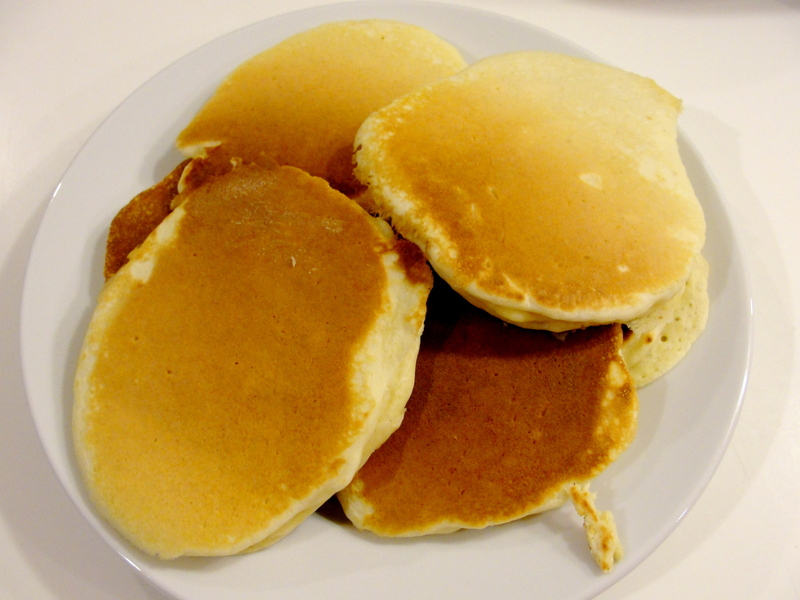 During the week, nuke the frozen pancakes for about 30 seconds or pop waffles into the toaster on a low to medium setting (it helps here to take your waffles out of the iron a few seconds early–they’ll finish toasting the day you want to eat them and crunch up really nicely), butter and enjoy. Supermom has nothing on you! I wanted to show you yesterdays’ lunch, which was re-mixed leftovers from the night before’s fish tacos. 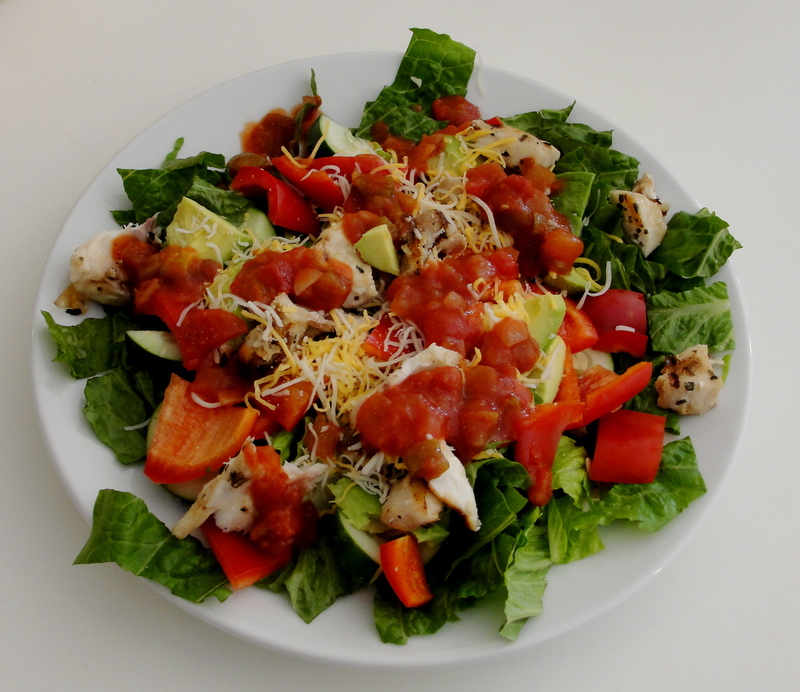 Super simple–romaine lettuce, red bell pepper (which is sweeter than its green cousin), diced avocado, a little cheese, the leftover rockfish, some cucumber, and salsa as dressing. Really good. Thinking of leftovers as more than boxes to be nuked up the next day helps break up the monotony when you have more of a dish than you can eat one night. This didn’t feel like leftovers. It felt like something entirely new. It was really tasty, filled me up, and had no trace of “tacos again!”. Which was awesome. This same salad works with chicken, leftover steak, leftover fish or shrimp, or just beans if you have some laying around. It was a happy lunch! I’m still giving stuff away!